Venice is one of the most unique cities in the world, a UNESCO World Heritage Site, representing a cultural and natural asset of exceptional value that needs to be preserved and passed on to future generations. To preserve its extraordinary beauty and uniqueness and its exceptional artistic and natural environment, without obstructing the development of other social and economic activities, Venice needs a sustainable tourism that blends in with the daily life of its residents. 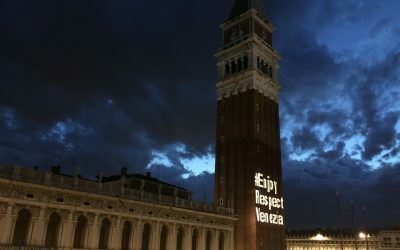 To this end, as of 2017- the International Year of Sustainable Tourism for Development – the City of Venice launched #EnjoyRespectVenezia, an awareness campaign aimed at encouraging visitors to behave responsibly and respectably towards the environment, the landscape, the artistic beauty and the identity of Venice and its inhabitants. The aim of the campaign is to raise awareness on the need to find a sustainable coexistence between tourists and residents, providing the tourist with guidelines that are compatible with the context and adapted to the local customs and traditions. The good practices for the responsible visitor are, in fact, outlined in a sort of handbook that includes advice, recommendations and information to help travellers become more aware and to fully enjoy the specific features of an urbanistically different city. Advice, indications and often real practical information inviting tourists to respect the city is published on-line through well-known figures as testimonials. Therefore, discover the hidden treasures of the city in the least visited places, explore the islands in the lagoon and mainland Venice, participate in events that are held throughout the Metropolitan City; taste the local products and the typical Venetian cuisine, visit the craft shops of the ancient trades that are still kept alive in Venice, buying only original products, book tours with qualified tourist guides who can tell you all about Venice’s thousand-year-old history; these are some of the tips to live an authentic experience in Venice. But, besides the tourist and cultural suggestions, information of a practical nature is also provided, such as walking on the right so as not to obstruct pedestrian traffic, not standing on the bridges, and not riding or even simply pushing bicycles in the historic centre. The public gardens are designated for breaks and refreshments. Food and drink must not be consumed at any time in and around monuments, church steps, bridges, wells, the banks of streams and canals, and especially St. Mark’s Square, which is a monumental site (in particular, along the arcades and steps of the Procuratie Nuove, the Napoleonic Wing and the Sansoviniana Library, Piazzetta dei Leoncini, along the portico of Palazzo Ducale, in Piazzetta San Marco and on the pier). The entire city of Venice is a city of art and as such requires respect: therefore, camping is absolutely forbidden throughout the city; likewise, littering and inappropriately disposing of any type of solid or liquid waste, vandalising with graffiti or padlocks, and feeding the pigeons. If you are staying in an apartment or flat, please find out about garbage collection and recycling. Do not walk about bare chested or in swimwear; do not dive or swim in streams or public canals or in St. Mark’s basin, also for personal and public safety reasons; the beaches of Lido and Pellestrina can be easily reached from the historic centre of Venice. Last, but not least, to fully enjoy the city and make the most of its services, plan your trip and stay in Venice at quieter times of the year when it is less crowded. A calendar is available on-line with a day-to-day forecast of the number of visitors expected in the City (the Tourist Report). To preserve urban cleanliness and the landscape, and also for public safety and hygiene the Municipal Police of the City of Venice has enforced regulations prohibiting certain behaviours. Violation of any of the regulations may result in the application of administrative fines from €25 to €500.